Beit Jala-produced olive oil are contributing to the Augusta Victoria Hospital finances. Each year, Augusta Victoria Hospital (AVH), located on the Mount of Olives, East Jerusalem, receives a special gift. Oil pressed from fruits of the 800 olive trees on the property is used on patients or as income to offset AVH’s operational costs. Olive oil from the AVH will be used at two healing services during the LWF Tenth Assembly. For the anointing, a minister will dip his or her thumb in oil and make the sign of the cross on the forehead of each person who has come forward for this gesture of healing. The AVH is operated by the LWF through its Department for World Service (DWS) program in Jerusalem. 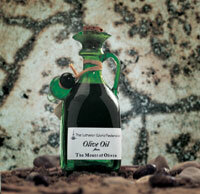 In 2000 LWF/DWS-Jerusalem began a project to produce bottled olive oil for sale to AVH visitors. The bottles are made from hand-blown glass in Hebron, and the olive oil is produced in a press in Beit Jala near Bethlehem. The income from some 130 bottles of olive oil sold in the first year was enough to cover expenses and make a small donation to the LWF for the hospital. A second project started in 2001 focuses on the need to continue planting new olive trees on the property. For a specific donation, individuals, churches or organizations could have a tree planted on the Mount of Olives, with a commemorative plaque stating the donor’s wishes. A third project launched in 2002 provides individuals, churches or organizations with an opportunity to donate a gallon of olive oil toward AVH patients’ needs. The hospital primarily uses the oil on many local dishes served to patients. In Palestine olive oil is a gift of life and health.